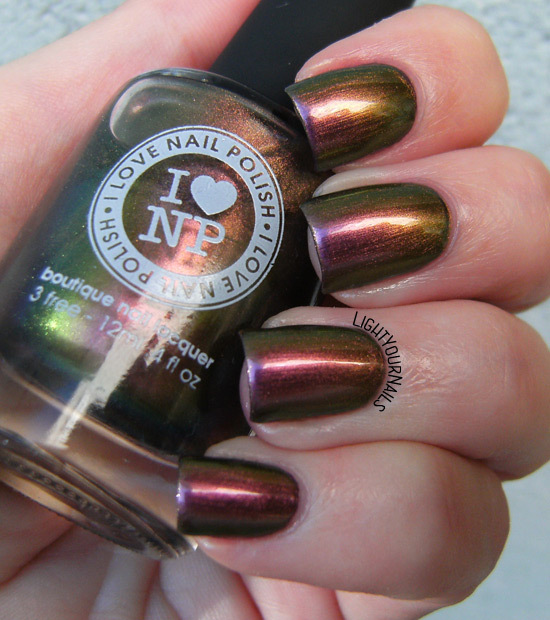 Indie Inlinkz - Favorite Fall Color: ILNP Nostalgia | Light Your Nails! Multichrome polishes are so prettyand this one is just amazing under the sunlight ! Thank you! Burgundy is a hard shade for me, I love it on other people but rarely on myself! Haha, I love the idea of cheating by using a multichrome! This is a great polish! E' stupendissimo *_____* e le foto sono meravigliose! L'autunno mi riporta la voglia di colori da "foglie cadenti": marrone, arancio...Oppure scuri. Anche multichrome così son perfetti! Hai ragione, anche io sono molto portata a quei colori caldi e scuri! To be honest, this kind of nail polishes isn't my favourite. My favourite autumn colour? I don't have one, I guess. It all depends on the mood. Oh really? I love these colours! ILNP polishes can be so gorgeous! This one is breath taking beautiful and it looks fantastic on your nails! Have a great day and weekend! i multicromatici non mi piacciono troppo, questo è bello ma non lo prenderei per me! Sulle prime, sono sincera, ho pensato che ti fossi confusa con Masquerade, il fratocugino. E mi pareva davvero strano, precisa come sei. Poi li ho tirati fuori e sì, si assomigliano parecchio! Mi ha lasciato perplessa la mutanda. Io gli ILNP li stendo senza (My Little Glacier escluso! ), e anzi, con la mutanda mi sembra ci perdano un po'. E' il mio unico ILNP quindi non potevo sbagliare! Secondo me con mutanda e senza non c'era proprio differenza alcuna. Aaaah, such a stunning colorshifter! I remember when the first 4 multichromes were released by I♥NP. I actually won a set :D! Since then her multichrome releases only got better with each new set. And even their holos look gorgeous, I'm sad I have none! That is beautiful! I really need to try a multichrome from this brand. What a fun color! My favorite fall color is Am I Ginger? from LynBDesigns. Oh my word yes I can see why this is a favourite! It is so gorgeous! Woooow! I love it, especially in direct sunlight, those extra sparkles are beautiful! This is gorgeous on you! I especially love how you captured that shift!!! I never get tired of multichromes. Ever. Such a gorgeous polish. I love the color shifts, but can never pull off the metallic look off very well. This is not overly metallic, I don't like that either. ILNP e multichrome? Sì grazie! Stupendo davvero, non c'è nulla da aggiungere!